Linda Christine lives in Aiken, South Carolina. Her garden has been featured in numerous magazines, including Southern Living. It is a study in sweeps of color, unusual plants, and whimsical touches. 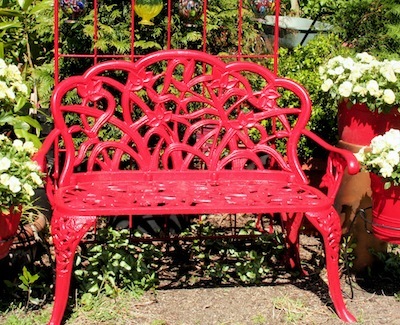 Where color is lacking, Linda adds it with her signature red painted benches. If you see Linda, you will usually see husband Sam, and vice-versa. They make frequent trips to garden centers where, more often than not, employees know them by name. They enjoy the hunt for new plants as much as the gardening itself. "We do love our flowers," she says. According to Linda, "We've always gardened to some extent but we've not always been this crazy with it." Sam retired from South Carolina Electric and Gas Co. and Linda from Life of Georgia Insurance Co. Sam says, "When I retired, I needed a hobby.” He randomly picked daylilies as his gardening hobby and it soon became a passion. Linda says, "The daylilies are his babies.” Phalaenopsis orchids are another newer interest of Sam’s. He also is the chief digger of holes and heavy lifter in the garden. Linda and Sam are both involved Master Gardeners. Linda says of their gardening, "We enjoy trying to teach other people what will grow and what will do well." She and Sam are always quick to donate plants to the Master Gardener plant sale. Linda is also an accomplished flower arranger and thinks nothing of putting together and donating 25 or more flower arrangements for local Master Gardener events. The flowers and greenery come from her garden and most often go home with lucky attendees. 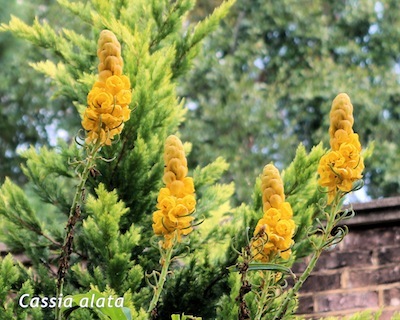 Candelabra Cassia (Cassia alata), a senna, is one of those easy, spectacular, and uncommon plants that towers in their garden. It has a most remarkable flower: tall, yellow, candle-like, impossible to ignore. It needs space but Linda says she easily grows it from seed each year. During January, there is not much going on in most gardens but in the Christine’s garden winter vegetables are growing in some unusual places. For example, they line the open-sided garden carts with scrap pieces of outdoor carpet and fill them with soil. Lettuces and even bulbs grow in these raised beds on wheels. If a hard freeze is forecast, it would be an easy task to roll them into the greenhouse, along with the many tropical plants wintering there. Maybe her insurance background has carried over into Linda's gardening life. Even though the climbing Gloriosa lilies (Gloriosa rothschildiana) are hardy in her Aiken garden, she takes some of the tubers inside since she would hate to be without them in her garden. She winters over at least one pot of each kind of sun coleus (Solenostemon scutellarioides) growing in the garden. Tropicals, ferns, and unusual plants move to the greenhouse when cold weather threatens. The unusual Dutchman Pipe vine’s (Aristolochia) purple mottled flowers fascinate visitors to the garden. It stays over in the greenhouse. Pots of Cat's Whiskers (Orthosiphon stamineus), Fire Bush (Embothrium coccineum), and Duranta (Duranta erecta), at least one pot of each, are placed inside to keep for next year's garden. Linda and Sam open their garden at all times of the year for group tours, neighbors, and passersby who see the sign in the front yard, THE GARDEN IS OPEN. Their garden was one of four first prize winners in a past Lowe’s Home Improvement and Briggs and Stratton’s national All-American Lawn Contest. Their garden is a favorite stop for outings. One year the Methodist Church Bible School brought a busload of children into the garden. They rotated activities every 30 minutes, with one group painting pots, another filling with soil, another planting, and still another looking at what was growing and blooming. The garden is also a favorite stop for Nursing Home residents. Both Linda and Sam find that sharing their garden is a fulfilling experience. 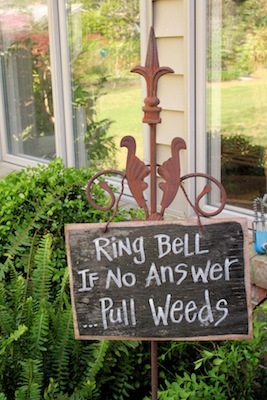 A sign by the back door reads, “Ring bell. If no one answers, pull weeds.” Visitors are only strangers once and feel right at home here, soon becoming friends who would cheerfully pull weeds in this lovely garden.